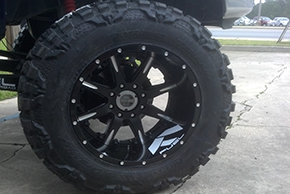 Our professionals can transform any truck,car and ATV giving it a much better and bolder appearance. Our tires are geared toward perfect performance, and they make for an excellent pairing with our selection of designer rims. Cars are increasingly being used as entertainment spaces, and our sound systems will allow for great audio experiences on any drive. We have the widest selection of lifts for trucks in Tifton, meeting with the requirements of all major manufacturers, many popular models, and plenty of model years. At Dirty South Kustoms, we specialize in giving cars and trucks some really stunning aftermarket enhancements. Whether it's the tires or wheels, the car's audio system, or even the lift on a truck, our professionals have been in the industry for quite some time and have combined decades of experience. Our extensive knowledge of vehicle modification, as well as the industry of manufacturers that makes our work possible, makes us an asset for local drivers. Perhaps best of all, we know that the best way to deliver amazing results to our customers is to listen to their unique perspective on how their car should look, feel, and sound. We work extensively with our customers to design the best modification for their needs and tastes. That means we're focused on everything from budgetary considerations to the exact systems and hardware installed. Customers throughout the area can count on the professional team at Dirty South Kustoms to deliver the best value in the area when it comes to aftermarket modifications. To get started with a free estimate, get in touch with our team today and let them know how they can transform your vehicle.